So today is finally the Big Reveal day and there are lots of pictures, so get your cup of coffee or tea and sit back and relax. 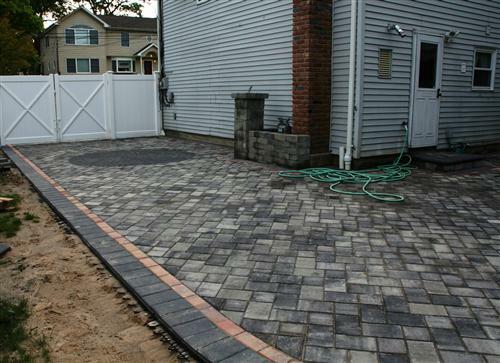 It only took the contractor 2 weeks to finish this paver/cement project and transform our property, but it took us 3 years to get to this point. It was well worth the wait. I’m going to take you through all the changes that happened over the 2 week period with this project, from Demo, to pavers, to sod, to the handrails and the complete after. I hope you have a little while to watch the changes that happened at our place. 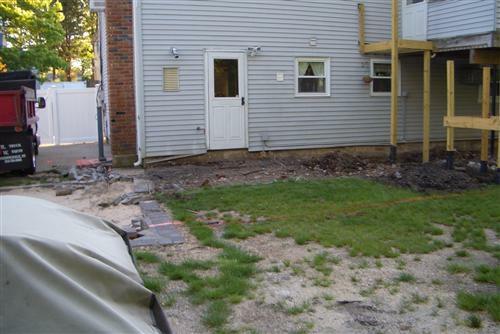 Here is basically what our property looked like before we started this project. This is not to scale, but I hope it gives you more of an idea of the property and what changed. And this is what the property looks like afterwards. 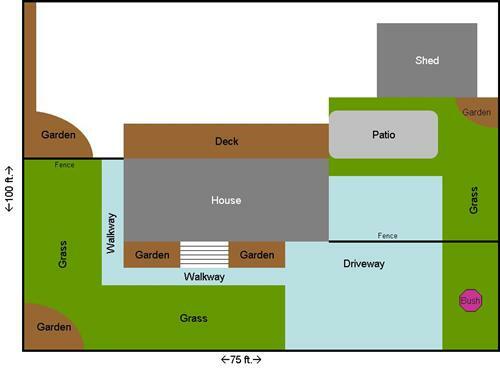 Well not with the curves in certain areas, because it just was not that easy for me to draw the curves of the backyard patio, but I hope you get the idea of what a big project this was for us. 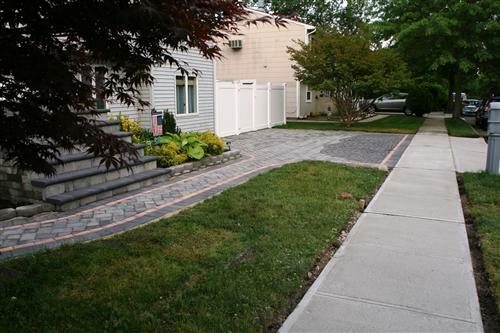 Just a reminder of how the yard was before, here are a couple of ugly before pictures. Here the demo has begone on the deck. We also had new stairs put in…well the beginning of new stairs being put in. The supports had to be put in before the pavers were laid in place, then they finished the stairs. The old staircase was in pretty bad shape. Lot’s of wood that needed to be replaced, sanded & painted or stained. But in the end it just didn’t seem worth piecing it together. This way we knew we had new stairs and they were going to hold up over time. The stairs go up to our Sunroom. Do you see all the toys and garbage that was found under the deck? 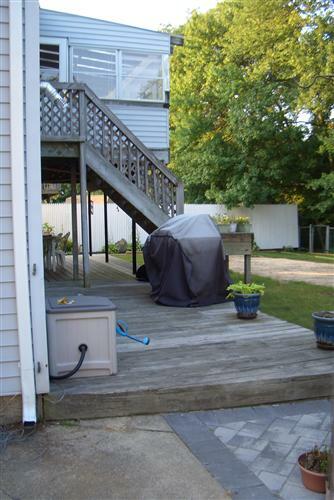 We have no idea how they got it there….the previous owners that is. Here is where are gas supply comes into the house. 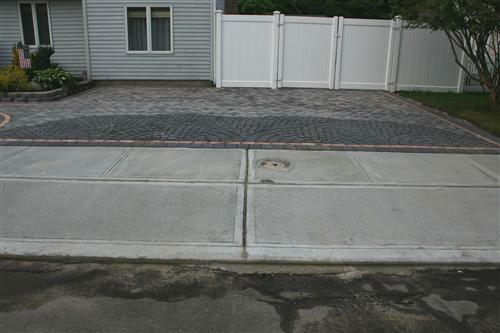 The Town told us because it is technically a driveway, we had to have a steel pole filled with cement installed so that a car could not hit it. So we painted it gray and we tried to hide it with trellis planters, but our contractor had a better idea. See the spray paint on the ground, that is where the wall & pier would go. Make a half wall with a lamp pier to cover up the pole. NICE!!! Awesome contractor, plus of course he got more money out of us that way, but in the end we were the happy home owners. 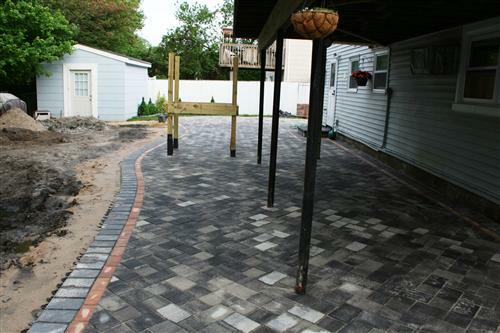 Now here is the backyard with the pavers down!!! I didn’t want to add all of the during pictures because there are already so many pictures. They had just finished the backyard and wet everything down so it will look lighter and darker in some pictures. We love it!!! The contractor did an amazing job. So this is where the ugly decking used to be. Now the patio is out further then the decking was, so we have more room for patio furniture and to have great gatherings. We have to paint these black poles white. Well we actually want to put PVC material around them and square them off so they look like columns more and not like ugly black metal poles. They were able to go right up to this garden bed, which was perfect, because there is a gate there to the left. This is our driveway side of the backyard. 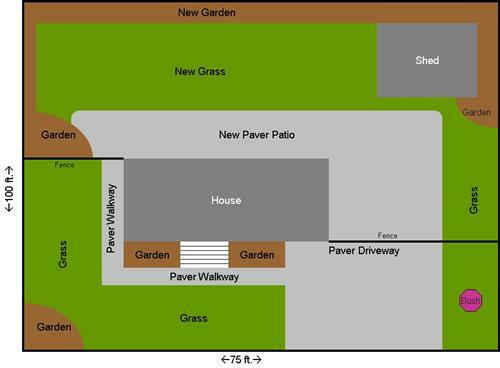 We can pull 4 cars total into the driveway now, three up front & one behind the gates in the backyard. Bascially the end that I’m standing at taking the picture is where we have a gazebo now. Pictures below. This is a close up of the circle that is in the picture above. 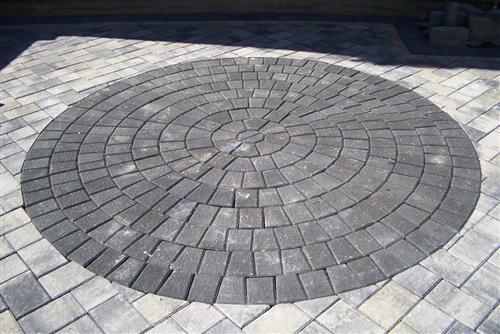 We had to break up all the lighter gray pavers, so we went with a circle here and we did something else up front in the driveway as well to break things up. Close up of all of the pavers. This is our back door stoop. 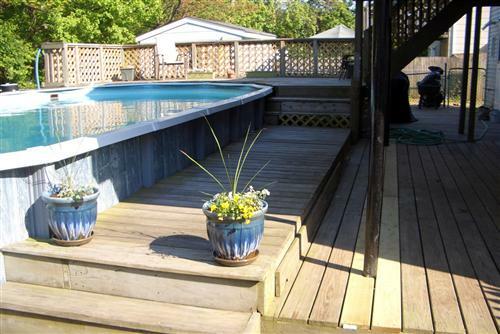 We wanted it to be a platform step, not just a 12 inch deep step. We didn’t want anyone just triping out the door, so the platform was better for our home. They did a great job designing it. We really didn’t know how they were going to do it, but we love how it came out. We had a landscaper come in and take up all the old grass on the whole property after the paver contractor was done. He leveled out the whole property for us and then laid sod. We wern’t going to do sod to save money, but we started this project in mid May and we really wouldn’t have had grass until the following season, so we just went for the sod. In this two week period of time we actually decided on sod & a sprinkler system to be installed. 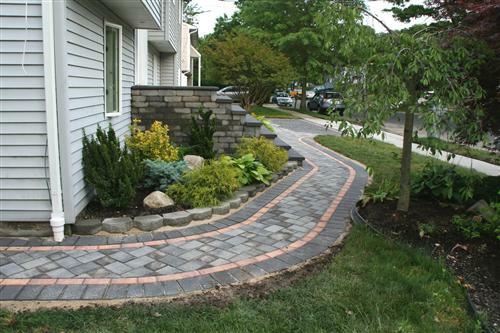 Thank god our paver contractor was so good to us. He went out and bought the PVC pipes we would need to run the sprinkler system to go under the pavers. Plus he came up with the idea to run our gutter drain pipes under the pavers and up into the grass. It’s a cool system that just pops up when it rains and closes when it’s not raining. We love it. Well worth all the extra money we had to spend. The only cement on the property is the sidewalk and the apron of the driveway. Here are the stairs almost done. Finished!!! We love how it turned out. 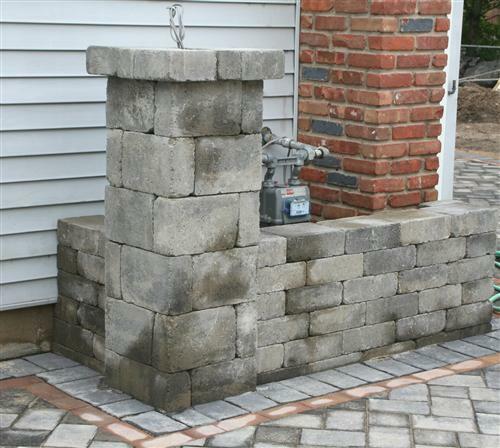 Here is the pier & half wall to sort of hid & protect our gas supply. But most of all to hide that ugly pole. Here it is all finished off with the light and plants to hide the meter more. We couldn’t build the half wall any higher because they have to be able to read the meter. And the light is great for parties. Here is the front yard. 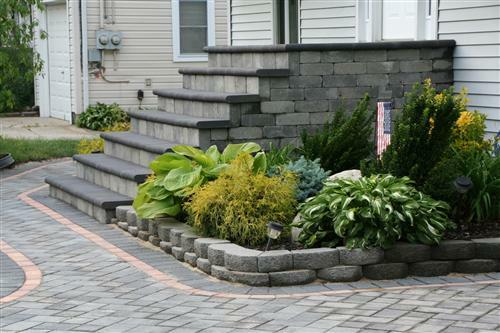 Our front stoop….oh how we love you. We hated walking up the old cement cracked stoop with rusty wrought iron handrails that were broken on one side. The contractor went right over our old stoop. No demo which saved us money. These steps are higher now and you just walk right into the front entrance instead of stepping into the front entrance. It’s steeper then the old one, but we are used to it now. It’s also about a foot wider because of the large bricks they used. No worries we installed handrails. Front walkway & double, well really triple driveway because we can park three cars wide in our driveway if we want. 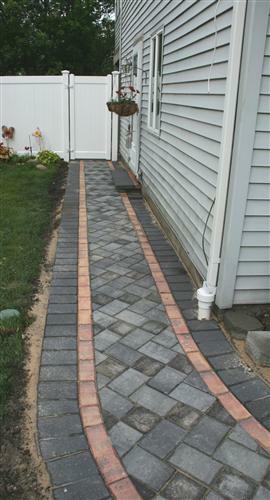 Side of house walkway. That small stoop is my Mom’s entrance to her apartment. You can see in this picture how the gutters go into the pavers and the PVC pipe goes under the walkway and up into the grass on the other side. You can see the little green cap in the grass area on the left of the picture. We went with fans at the end of the driveway to break up the all gray area in the middle. We love how it turned out. View from top of stoop. 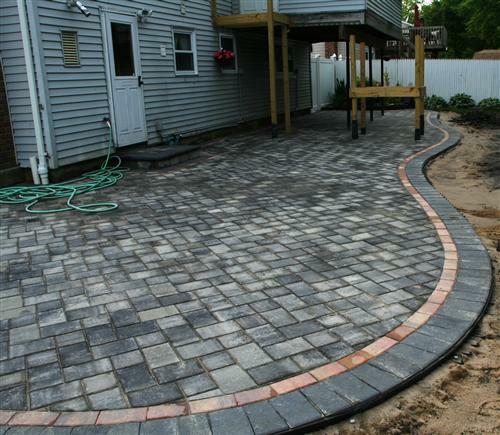 You can see more of the details of the driveway. Speaking of the top of the stoop, this is what the landing of the stoop looks like. Here are the handrails installed. We went with PVC rails. We love it. Never have to worry about them again for the life of the house probably. We just went with simple spindles, because that what worked best with our homes style. We added potted planters to the stoop to add more color. View from on top of the stairs in the backyard. As you can see from this picture we still have some other projects to do, like paint the wood beams that support the Sunroom. We already painted the stairs. Now they blend in with the house and yard better. We really didn’t want to leave it a stained wood color. So we used Cabot stain which is really a solid paint color that we used. Cabot has stains that are the thickness of paint, actually thicker. This was really thick paint and went on really nicely. We don’t really regret painting it. Hopefully it lasts for a long time. It took two days to paint all the stairs and rails. We went with white on the rails & gray on the steps. You can see from this picture how the stairs blend in since they are painted. 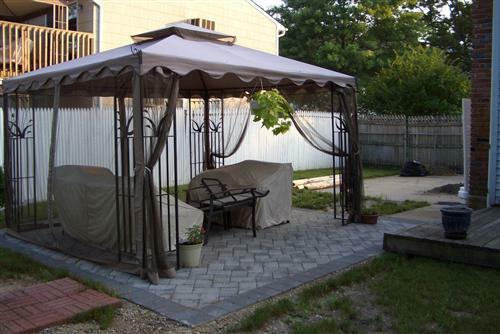 I need to add a rug, some pop of color with pillows & maybe a lantern or two to the gazebo area. Here are some of the details in the backyard. Everything is so full and in bloom now…love it!!! Here is our little water feature. They sell a Fountain in a container at Home Depot. We bought it last year. It comes in a 5 gallon container. The rocks, the pump & the container just go into a bigger planter and you have a water feature. I bought the planter at HomeGoods for $35 last year. 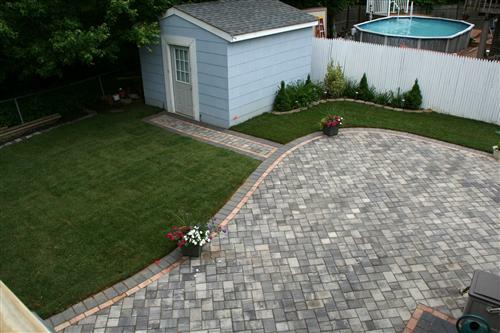 Here is all the paver information: Pavers are Nicolock Holland Stone. 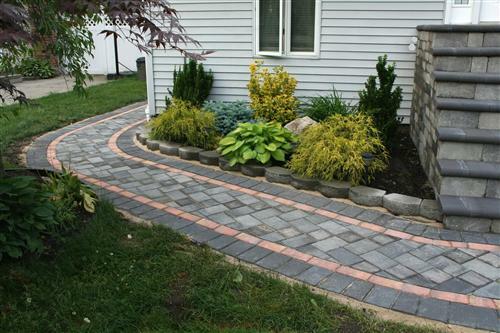 Outer border is Charcoal, red border is Bayberry Blend and center pavers are Granite City Blend. 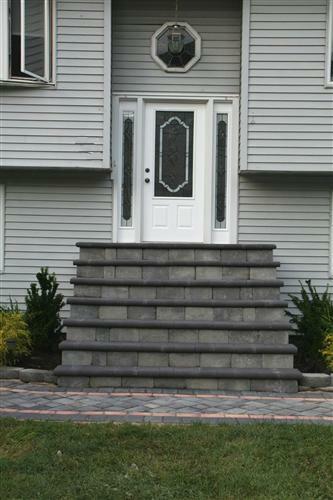 The stoop bullnose is Nicolock Charcoal, but the risers and the sides of the stoop are Cambridge Onyx Natural. 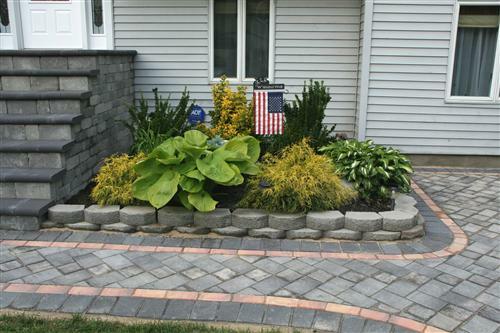 The light pier & small wall are also Cambridge Onyx Natural. 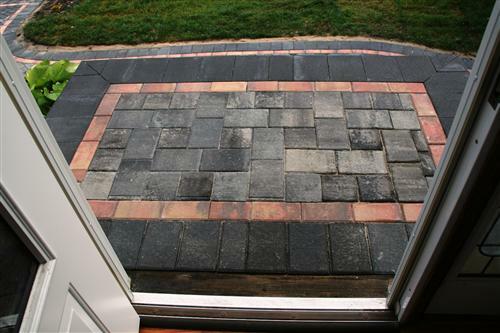 Nicolock also has these same bricks, but they weren’t available for our project so we went with Cambridge. We love all the choices we made. If you have any questions at all, either email me or comment on this post. I would be happy to answer your questions and try to help. You can check out the full Outdoor Series from the ugly beginning in these posts: Post 1, Post 2, Post 3, Post 4, Post 5, Post 6, Post 7, Post 8. What an amazing makeover. 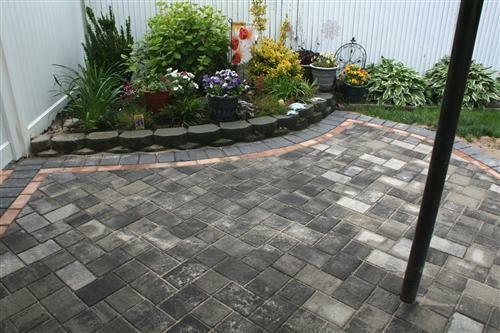 Love the pavers. I'm sure you're loving your yard these days. 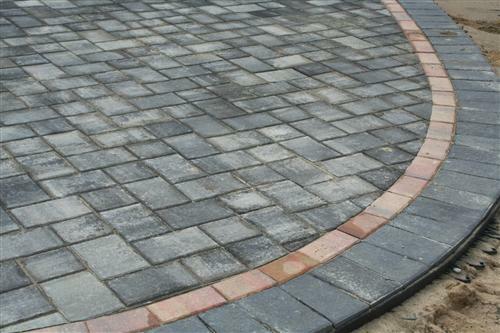 Looks fantastic – lots of work (for the contractor) – but so worth it.